Genting Highlands, like another Malaysian vacation destination – Cameron Highlands, was originally conceived of as an ideal resort-style location not only because of its exceptional natural highland beauty, but because of its natural chilling climate. The development process itself involved taking nearly 15,000 acres of jungle land and transforming it into what is now a relaxation destination famous over the world. Today, Genting Highlands is home to a variety of beautiful hotels that run wide range of hotels from luxury resort to budget accommodations, the better to serve a full range of economic classes. Over the years, many additional attractions and even amusement park-style rides have been added for the enjoyment of the people. These attractions include but are not limited to options like Space Shot, Snow World, and a Ripley’s Believe It or Not museum. Genting Highlands is also home to Malaysia’s longest cable car system. It’s conveniently located close to major Malaysian destinations like Kuala Lumpur as well. The main bus terminal in Genting Highlands is First World Bus Terminal, whihc is located juts beside the entrance of First World Hotel. 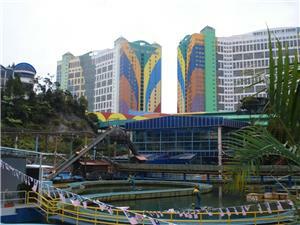 (It is also the terminal for Taxi and city bus between KL and Genting). City bus runs between KL and Genting at high frequency with reasonably affordable bus fare. It serves well for visitor coming from KL. 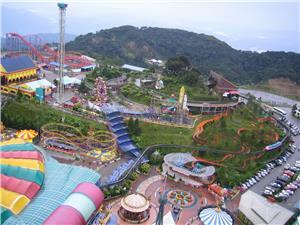 Genting Highlands is also well connected to other cities in Malaysia, as well as Singapore by express bus service. For more information about Bus to Genting Highlands, check out details from us today!